The Utah Division of Arts & Museums has announced the recipients of their 2019 Utah Visual Arts Fellowships: Jim Jacobs of Ogden and Shane Deeter of La Sal. Each artist will receive a $10,000 fellowship to recognize their work and encourage further development. Jim Jacobs, “Cocoon,” 2004. Photo courtesy of the artist. 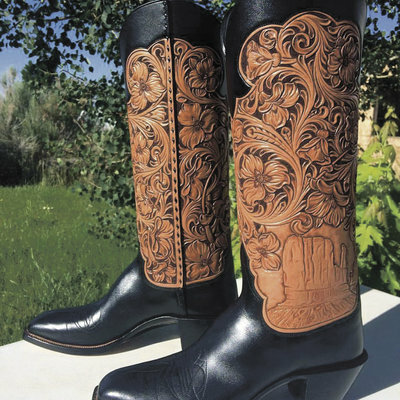 Utah-themed cowboy boots by Shane Deeter, 2017, courtesy the artist. By contrast, Deeter, a leather craftsman known for his finely worked saddles and boots, comes from outside Utah’s normal fine-arts circuit. He grew up on a ranch and worked at his father’s boot and saddle repair shop before attending Utah State University, where he made custom leather goods to help pay for his education. Since 2000, he has turned it into a full-time job, and he has won several awards for his work. He says he plans on using the funds to further his skills by taking silversmithing and engraving classes.